Sushil Kumar has a recurring dream, a daydream induced with the aid of his laptop, in which he sees visions of his days of glory. Specifically, August 20, 2008 — the most glorious day of his austere, regimented life. That August day four years ago in Beijing, he beat three opponents in 70 minutes to win a bronze medal — India's second medal of the 2008 Olympics, and the second wrestling medal for the country, 56 years after KD Jadhav's bronze in Helsinki 1952. Sushil loves to replay the recordings of those fights on his laptop — to perhaps strengthen his 'fighting gene', to go on believing that what he did in Beijing can be done in London. Will India’s weight be over ? Sushil Kumar Solanki is thrilled at being chosen the flag-bearer of the Indian contingent for the Olympics. He considers this a very big responsibility, a great honour. "It is a privilege to be chosen the flag-bearer of the contingent. We will do our best to uphold the image of the country in the Olympics," Sushil said at a farewell function for the five-member wrestling team here today. Suresh Kalmadi might be facing intense pressure from various quarters here to cancel his London Olympics trip, but the International Athletics Federation said it was not going to stop him from attending the IAAF Council meeting in England’s capital. Set to embark on a short tour of Sri Lanka, Indian cricket captain Mahendra Singh Dhoni today said that it was important for his team to begin the new season on a good note by performing well in the limited overs series. The Indian cricket team's brief two-day camp came to an abrupt end today after a sudden downpour forced the players indoors at the M A Chidambaram stadium here. In London, four other Indian wrestlers want to live Sushil's dream of 2008. Three of them are men and the fourth is a lady, the first Indian woman to qualify for the wrestling at the Olympics. 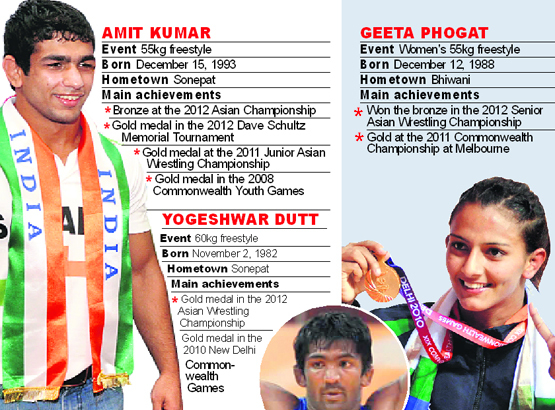 In India, not many sports can boast more than one medal in the Olympics. Wrestling, a mainstream sport in India and perhaps even the mother of all sports from time immemorial, has given India two bronze medals. Hockey and shooting are the only other sports in which India has won over one medal. Well, actually India has won medals in only three other sports — tennis, weightlifting and boxing. But numbers look good in the current wrestling team — with five of them hitting the mat in London, India hopes fervently for medals in wrestling. The men - Sushil Kumar, Yogeshwar Dutt, Amit Kumar and Narsingh Yadav - are joined by Geeta Phogat, the Haryana lass with wrestling in her genes. She qualified at the Asian Olympic Qualification Tournament in the 55kg freestyle category. The squad is a blend of the experience and youth, and the coaches are hopeful of a good show in London. Though he already has an Olympics medal, Sushil is deeply motivated - he says he won the first medal for his parents and coach, and now wants another for his wife Savi. 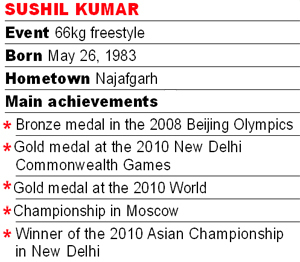 Equally motivated is the experienced wrestler Yogeshwar Dutt, who lost a very close quarterfinal in Beijing. Yogeshwar's coaches have faith in his ability and he remains a strong prospect. The two youngsters, Amit Kumar and Narsingh, present exciting possibilities. Amit, 19, won the Dave Schultz Memorial this year, apart from a bronze in the 2012 Asian Wrestling Championship. He is very excited about London, and he knows that he can't take it lightly. "Age won't matter, he's extremely talented," says his coach, Mahabali Satpal Singh. "He's been training since he was in Class 6, when kids don't have a clue what professional sports are. He is very sure he'd win a medal in London, and so am I!" Amit grew up idolising Sushil and Yogeshwar and often trains with them. 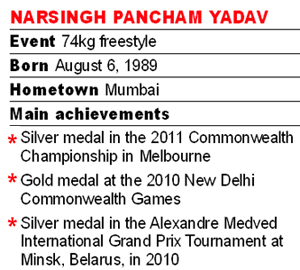 Narsingh Pancham Yadav, who caused a stir by winning the last World Qualifying Tournament in Helsinki in May, debuts in the Olympics after notable results in the last two years. He won the silver at the 2011 Commonwealth Championship at Melbourne and the gold in the 2010 Commonwealth Games in New Delhi. Geeta Phogat, the first Indian woman wrestler to win a gold in the Commonwealth Games, also eyes a medal in London, hopefully gold, for which she's been training with chief coach OP Yadav and foreign expert Ryan Dobo. Born in a family of wrestlers in Bhiwani, Geeta started early training at age 12 under her father and coach Mahavir Singh. A well-known wrestler himself, Mahavir motivated his five daughters to take up the sport, and they've made him proud. Delighted that she will become the first Indian woman wrestler to compete at the Olympics, Geeta credits her family for her success. People used to say that he was crazy to allow his daughters to wrestle. "Ever since we started, my father said his daughters would make the country proud," she told The Tribune. "I want to turn that dream into reality. In the 10 years of my career, hard work has been my mantra." All five are medal prospects, as former Indian women coach PR Sondhi says: "In case things go smooth and none of the players suffer an injury, they can easily win two medals." The 2008 bronze raised expectations. Does that add to the pressure? Success does not come alone, it brings along a lot of responsibilities and I am glad that people are counting on me to win another medal for India. To be honest, I will not say that I am completely unaffected by the people's expectations but I am certainly not under any kind of pressure. There is a thin line between pressure and excitement... I’m more excited than I was before Beijing. You were not very well known before Beijing but your medal made you a star. Now that the youngsters took up to you, how do you feel? It is definitely heartwarming. I am grateful to God, my family, coaches and well-wishers who shaped me into what I am today. I feel extremely glad when young players come to me and tell me that they want to follow in my footsteps. That's when you feel that your hard work has paid off. But I still want to do a lot more and don't really see myself retiring soon. How are your preparations for the London Olympics? All the wrestlers are in the best of physical and mental condition. The recent camp at Colorado Springs has proved fruitful as we got to test our skills, speed and stamina against some good opponents. That has helped us improve on all fronts. Which Indian wrestler is capable of winning a medal in London? All of them are extremely talented and it can be anybody's bout on a given day. They have left no stone unturned to make their presence felt at the Olympics. I am overwhelmed to see the conviction of the wrestlers who will make their debut at London. One look at them and you know why they deserve to be there. Your message for budding sportspersons? Always stay focussed, keep working harder. If you achieve success, always remain grounded because if success goes to your head, you’re finished. The humble and down-to-earth Sushil, who readily obliged numerous requests for soundbites, said the technical and fitness regimen the team underwent in the US has made him and others fit and ready for the Olympics. "We are thoroughly focussed, and our stamina has gone up," he said. He said he would compete in the Olympics with a relaxed frame of mind, without putting pressure on himself. He did concede that people expectat a great deal of him after his bronze at Beijing 2008. "I will try my best to win a second Olympics medal," he said. "If we get a favourable draw, both Sushil and Yogeshar Dutt can figure among the medals, even win gold," noted team leader and former international Raj Singh. Raj Singh, also the secretary-general of the Wrestling Federation of India, said his role as the team leader will have multiple utility. Since he would be staying with the athletes in the Village, he would coach and mentor the wrestlers; and during the competition, he could play a role in contesting debatable points. "One should know when to protest against a decision, else the wrestler will get a negative point," he pointed out. The wrestlers and their coaches — Vinod Kumar, Yashvir Singh and O.P. Yadav — were given a warm send-off at the event. Sushil's mentor and coach, former Olympian Satpal, said after meeting Sushil Kumar and the others, his expectations of their winning medals in London have gone up. Satpal, whose daughter is married to Sushil, said the grappler has been working very hard. “For the past 12 months, he has been regularly attending the Olympics coaching camps, missing his family,” he said. "Sushil is very confident and positive. His confidence rubs off on to others as well. I am relaxed and confident after meeting Sushil," said Satpal, who won a gold medal at the 1982 Asian Games. A bus carrying weary US athletes from London Heathrow airport to the Olympic Village took four hours — twice as long as the world record for the marathon! Hurdler Kerron Clement, on board, tweeted: "We've been lost on the road for 4hrs!” As the driver tried to find his way, Clement added: "Athletes are sleepy, hungry and need to pee … Not a good first impression”. Oscar Pistorius heads into his final pre-Olympic test admitting his frustration at the lingering suggestion in some quarters that he might gain an unfair advantage with his carbon fibre prosthetic blades. "It irritates me when I read something and the facts aren't there," he said. President Barack Obama has said that the US men's basketball team, led by Lebron James and Kobe Bryant, has "unbelievable talent". "There's no reason we shouldn't bring home the gold," Obama said. Bryant, he added, "is such a competitor so we can expect him to do a little trash talking". Bouts can last for a maximum of three periods of two minutes, with a 30-second break in between periods. IAAF Deputy General Secretary Nick Davies told PTI that the world body does not see anything wrong in Kalmadi attending its Council meeting in London. "Kalmadi is an elected member of IAAF Council so logically, he is invited to attend the Council meeting in London," Davies said when asked about IAAF's comments on the controversy generated in India over Kalmadi being allowed to attend the Games. "As far as we are aware, his legal case is on-going and he has not been convicted of any wrong-doing," he said. Davies said that two IAAF Council meetings are being planned in London during the Olympics — on July 31 and August 10. Dhoni said that a good series against Sri Lanka would also be a confidence booster for the Twenty20 World Cup to be held in September-October in the same country. India play five One-dayers and one-off Twenty20 against Sri Lanka starting July 21. "It's hectic schedule but as professionals we have to maintain our standard. We will play in different venues and travelling will also be there. It's the start of the season and we want to start it on a good note," Dhoni told reporters ahead of the team's departure tomorrow. "Sri Lanka is not a new place for us. We have played series there at least once each year and even twice in a year. Heavy rains at around 5:15 pm local time forced the closure of the camp about two hours before the scheduled time. The 15-member Indian team will be leaving for Sri Lanka tomorrow afternoon to play in a five-match ODI series followed by a Twenty20 International, commencing on July 21 at Hambantota. During the two-day training camp, the Mahendra Singh Dhoni-led team had strenuous sessions in the limited time they got. The camp started yesterday under the watchful eyes of coach Duncan Fletcher, bowling coach Joe Dawes and fielding coach Trevor Penny. After a stretching and physical conditioning session on both the days, the players assembled for the usual football match that lasted for about 20 minutes.